In the second quarter in Seattle, the Saints were cruising along innocently enough. They had opened up two 10 point leads, though consecutively interrupted by the opposing tight end latching onto a pair of touchdowns, one of them after doing a Polynesian belly dance. Unbeknownst to everyone, the hull had hit an iceberg in the Pacific Northwest. One constant for New Orleans’ NFL representative is that it does know how to make history. Midway through the third quarter, the Saints had taken on lots of water and were sinking, by 14 points, to the lowliest playoff host in the 90 years that pro football has been played. The Horror. Creaky Seattle quarterback Matt Hasselbeck was on deck, resurrecting his career by lobbing snowballs to receivers that Saints defensive backs were getting to know by reading the names on the backs of their jerseys (it didn’t appear they recognized them from film room study). The ‘Hawks were reeling them in like Toys For Tots at Christmas. See what I got! Look-ee, how about this one! And this one! Wow, this is fun! Hasselbeck was under such little pressure, it was as if he were wheeling around in a nursing home. In his aftermath press conference, Captain Sean Payton put the win-or-lose-as-a-team spin on the disaster, as he had to, but reality is this ship split in half. NBC’s Rodney Harrison minced no words in his post-mortem commentary, saying the Saint defense was “terrible – soft, and no energy”. Chandeliers blinked, shook, and fell in the State Room when Seattle’s Marshawn Lynch imitated Ray Rice in Baltimore from about a month ago, and eluded the grasp of, count ‘em, EIGHT Saints for a long, clinching touchdown run. Somebody check his boarding papers! Those kinds of plays are only supposed to happen in pro ball about once a decade. Along the way, Super Bowl hero Tracey Porter was discarded like a piece of cellophane wrapper. First Mate Drew Brees didn’t give up, putting New Orleans in comeback position, however unlikely. But after one of Capt. Payton’s not so good signals, a lame, run attempt at a two point conversion, giving the ball to a new back who had been in living quarters with the team for all of about 4 days, an onsides kick was pooched right to the opposition (this wasn’t the first time that happened this season, either). ‘Dat’s all you got in the way of a life preserver? At that point, all that remained for the Black & Gold, 2010 version, was to rear up and shoot the moon, the letters S.O.S. glistening above the rudder, and spectacularly nosedive – into chilling depths of despair. It left only swells and bubbles on the surface, for what might have been. The Ten Saints were an unfortunate reprise of the ’07 -’08 innocuous outfits, which were little more than puppet stages for the statistical compilations of Drew Brees. Those defenses didn’t stop for a red light, either. Even with the injury to safety Malcolm Jenkins, the extent of the defensive implosion was perplexing. This was a unit that had shown legitimate structural engineering in boiler room pressure cookers, when blanketing the Vikings to 9 points in the opener, pulling the curtains shut on Pittsburgh, and clipping the wings of the Falcons in their place, in a rare home loss for them. One player said he couldn’t explain it either, saying coordinator Gregg Williams prepared them hard. One can only guess if it was too hard, the players on their feet and hitting too long all week, leg weary and sore, because the Saints were Ice Age slow in getting off the ball, and flat as pancakes. One can’t imagine Coach Williams in a meeting, exhorting his troops to “just hold ‘em to – 35 points – and we win!” This affair was not supposed to resemble a Hornets game. “Disappointing” was the media consensus concerning the sinking, which is an understatement. If the late Buddy Diliberto were taking phone calls on the radio, he wouldn’t be soliciting dialers for Dr. Kevorkian and 1-800-BAD-TEAM, but for Dr. Phil and 1-800-DIS-GUST. One of his successors, Bobby Hebert, was more direct, saying it was “garbage” that Seattle even stayed on the field with New Orleans. It will be of little consolation to The Nation when the Seahawks show their true colors and get drilled in the ensuing round of the playoffs. This Cinderella isn’t pretty. 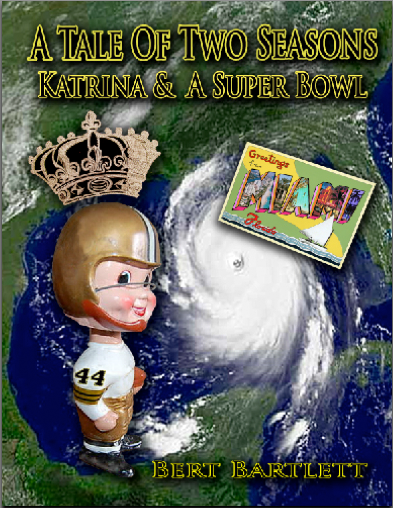 The coldest temperatures are that the Saints are relegated to a flooded engine room, once again looking out at the pantheon of elite NFL franchises, their Super Bowl title defended with a whimper instead of a bang, other than the media’s amusement with the upset. Boarders of the vessel in the North Atlantic went down more nobly. The Saints’ most unheralded characteristic that got them a trophy, their resilience, never really got unpacked out of the travel bags, at least on one side of the ball. ’Dat was sad. But what a ride it was. There’s not one iota of positive that can be deduced about this nightmare, other than the realization that expectations are higher around here these days. The Saints played to sold out crowds in the Crescent City for 20 years before they had a winning season. Nor is there room in the dinghy for talk of the draft, possible roster and assistant coaching changes, and the ultimate cliché battle cry of New Orleans, “next year”. That’s all dead weight for the moment. What’s left of the Saints has to make its way back to shore first, and with their sudden descent from the post-season, they have plenty of time to bundle up and paddle along. Previous Post What Was ‘Dat?